A homecoming parade is a beautiful thing, but what veterans and their families really need is for America to keep its promises. I love the new Budweiser commercial that’s airing in today’s Super Bowl. Since Anheuser-Busch released the one-minute ad featuring Army Lt. Chuck Nadd, who served as a helicopter pilot in Afghanistan, and his surprise welcome-home parade put on by his hometown of Winter Park, Florida in conjunction with Anheuser-Busch, my eyes well with tears every time I watch it. As the wife of a retired Marine, I’m grateful to Anheuser-Busch—and all Americans—for these demonstrations of appreciation toward our veterans. My own husband’s homecoming from Iraq on a cold Valentine’s night in 2009 wasn’t nearly as exciting and romantic as the one shown in the Budweiser commercial. He arrived at Kansas City International airport near midnight, virtually anonymous save for his high-and-tight, disembarking from a commercial jet wearing civilian clothes because he’d already gone through post-deployment debriefing with the 1st Marine Expeditionary Force in Twentynine Palms, CA, and Marines don’t wear their uniforms (for security reasons) when flying on commercial aircraft. So when he finally emerged from the deserted gate area it was just him and me and a long hug and silence. We were both too choked up for words, but the hug said everything we needed it to say. I’m happy so many people will see Budweiser’s “A Hero’s Welcome” commercial during the Super Bowl today. I think it will bring tears to a lot of people’s eyes, not just veterans and their families. I know the gratitude people feel toward our veterans is genuine. But if you’re not in the military, or related to someone who’s in the military, you probably don’t know that this past December, Congress passed legislation as part of the Bipartisan Budget Act of 2013 that, starting in 2015, will reduce the Cost of Living Adjustment (COLA) of retired service members’ pensions by 1% per year until the age of 62. This may not seem like a lot, but according to the Military Officer Association of America (MOAA), this amounts to a potential lifetime loss of nearly $83,000 for an enlisted service member with 20 years of service and approximately $124,000 for an officer with 20 years of service. Maybe you’re one of those people who think that military pensions are too generous. After all, a person can serve 20 years in the military, retire at a relatively young age, start a new career and earn a paycheck from that job while also collecting a monthly military pension. Just looking at the numbers, it does seem pretty generous, especially when compared to most other jobs with limited or non-existent pension plans. But I’m pretty sure the folks who think that military pensions are too generous—that cutting service members’ retirement compensation is no big deal—have never served in the military, or had a family member who served. And if you’re one of those people, I don’t blame you for not being aware of the hidden costs of military service. If you’ve never worn the combat boots or stood at the tarmac waving goodbye to the person you love, how could you possibly know the sacrifices involved in serving in the military? Most everybody knows about the scariest and most dramatic aspects of military service: the possibility of losing one’s life, of suffering permanent physical injuries and/or lifelong psychological trauma—these are the more obvious risks associated with putting one’s self in harm’s way. Then there’s the extended absences, the heartbreak of missing important life events like the birth of a child or your teen’s high school graduation, and the emotional toll these absences take on marriages and children. 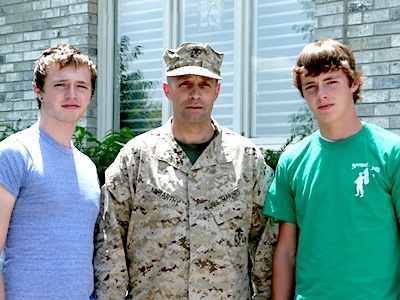 While these are the most well-known types of sacrifices made by service members and their families, if you’re not from a military family, you’re probably not aware of the more mundane, long-term costs associated with military life. Like the fact that most military families never have a chance to build equity in a home because of moving every three years and, even if they’re lucky enough to purchase a home (vs. renting) at each duty station, they usually take a loss or break even every time they have to sell. And have you ever considered how nearly impossible it is for most military spouses to sustain a career when they not only have to switch jobs due to moving to a new location every three years but are also left in charge of finding the new house, selling or renting the old house, enrolling the kids in new schools, finding the new dentist, etc. because their service member is either deployed or required to devote his time to getting “snapped in” to the new job? This inability to maintain a career over the 20+ years of a spouse’s military service costs military families hundreds of thousands of dollars in lost wages, not to mention the chance to earn an additional pension. Because—assuming a spouse is able to find someone willing to hire him or her at each new duty station, most military spouses never have the chance to keep a job long enough to earn retirement at any one location. So, you say, military people knew all this stuff when they signed up. Yes, that’s true. Military people were also told when they signed up that they would earn a specific amount in retirement earnings based on their rank and time in service. Not just told, but promised. And a lot of service members—and their families—made the decision to stick it out long enough to reach the 20-year mark for precisely that reason—so they could earn the retirement benefits they were promised. And now Congress is reducing those benefits—taking them away from our service members. By passing this legislation, Congress is saying, yeah, we did promise you a certain compensation package when you signed up, and yeah, you did risk your life and health and family stability thinking you would receive that certain compensation package if you stuck it out long enough. But we really gotta balance that budget, so we’re yanking the rug out from under you and just changing the terms of our agreement with you a teeny tiny bit, and though we know you military folks are going to hoot and holler about it, we’re betting on the fact that the average American either won’t notice or won’t care. As the wife of a veteran I admit to taking this a bit personally. And yeah, I’m angry about the potential loss of income from my husband’s retirement pay. But what really concerns me—beyond the lack of integrity shown by our Congress in breaking a promise made to our service members—is how this bait and switch will affect the future strength of our all-volunteer force, playing out in recruiting stations across the U.S. I’m picturing a recruiter sitting down with a young recruit and his or her parents or spouse, talking about the great benefits package he or she can look forward to upon retirement, when the potential recruit replies, yeah that all sounds great… but what if Congress decides to take those benefits away from me after I’ve put in my 20 years, like it did to service members in 2013? Wow. You brought up a lot of things I didn’t think about, such as not earning equity in your houses. I’m a huge fan of our military from soldiers to spouses and kids. I sent my emails today. Thank you for writing about this. Thanks Nan for bringing up all these great points and sacrifices that military families make. I hadn’t thought about the equity in a house or the spouse not being in a job long enough to get retirement benefits. It really angers me that Congress will mess with the military instead of looking at so many other wasteful things going on in Washington. I will go to the website you posted and send my emails. Thanks for your service and sacrifices! Message sent! Thank you for shining a spotlight on this travesty Nan. Your eloquent argument is hard, no, impossible to dispute. I will certainly encourage all of my friends and family to send messages as well. I sincerely hope that positive action is soon taken in Congress on this matter. If you happen to know of a veteran having a problem with transition back home, try checking out Colonel Mike Grices’s site – a great help! Hi, this blog piece isn’t about reintegration or transitioning to civilian life, but I’ll let the post stand since it’s relevant to veterans in general and I like to support veterans and my fellow independent authors. In the future it would be best if you contribute something to the conversation first, then post the link to the book. Thanks. Well told. I too liked that commercial. Know that Pat is not a former Marine, he is and always will be a MARINE. You are so right Mike. Ooorah!